3 scoops Naturade Total Soy Chocolate Powder, 3/4 Cup water, 3 egg whites, Fat-free whipped topping, if desired, cocoa powder, for dusting, if desired. Place Naturade Total Soy Chocolate Powder, water, and egg whites in blender. Cover and blend on high for 1 minute. Pour into 4 small serving dishes and chill 2 hours. 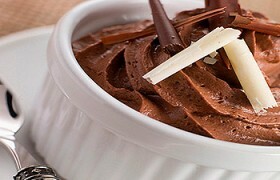 When ready to serve, top with a dollop of whipped topping and a sprinkling of cocoa powder, if desired.